Legos are pretty fun to tinker with, and you've decided to build some sort of shape. But once you pick it up, you discover that you didn't plan it properly, and your wonderful shape just falls apart. Now, you're planning to build something big, and so you're going to use the computer to help you. 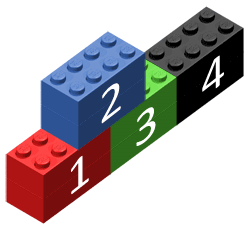 Write a program, that given the layout of a Lego design, outputs the number of pieces it would break into if picked up. The Legos will be built on a x-y coordinate plane, with (0,0) being the bottom left corner. The blocks are flat on your carpet, so a block will never 'fall down'. (If you haven't seen a Lego brick before: A Lego brick has grooves on its top that match with notches on the bottom. If a groove and a notch bind, the bricks will stay together. See the diagram. This means that there is a brick with bottom left corner (x1,y1) and top right corner (x2,y2). The number of separate pieces these blocks form. Blocks #1,2,3 are joined securely. However, #4 is just hanging around.